The incident with the apparent contamination started back in May when the FDA first learned of a sudden number of illnesses linked to salmonella occurring in multiple states. The agency investigated the situation and linked the outbreak to Honey Smacks, one of Kellogg’s many sugar-laced cereal options. By June 14th, the company announced its recall of the product—pulling it from the shelves of most states, as well as in Guam, Saipan, and internationally—and provided samples to the FDA to test for salmonella. According to the Center for Disease Control and Prevention, that have been at least 100 reports of people becoming ill. The reports stem from 33 states. Thirty people have been hospitalized due to the apparent outbreak, but there have been no deaths reported. 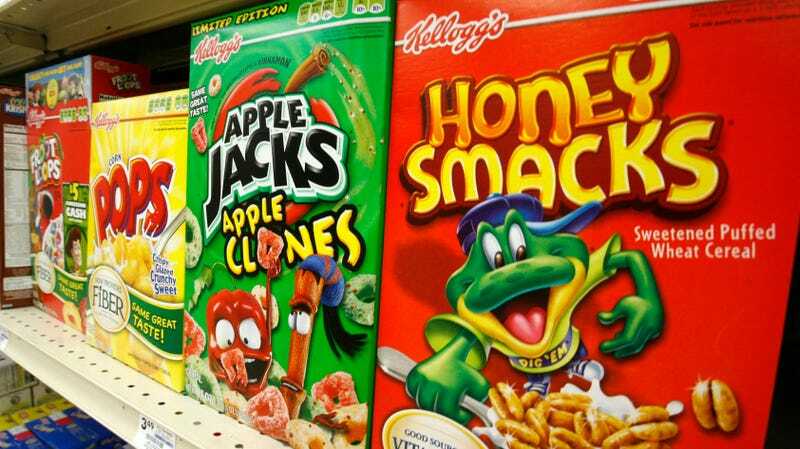 The FDA has become aware that recalled Kellogg’s Honey Smacks cereal are still being offered for sale. All Honey Smacks cereal was recalled in June 2018. The FDA has learned that some retailers are still selling this product. So that’s not great. While the FDA works to get the potentially contaminated cereal out of circulation entirely it’s up to you, the consumer, to exercise some additional caution with your breakfast buys and opt for one of the many sugary alternatives available in the cereal aisle. If you spot a box of Honey Smacks at your local cereal dispensary, take a look at the back and make sure it’s not one from the batch that may be tainted by salmonella. The recalled boxes come in two sizes: 15.3 ounces and 23 ounces. The 15.3-ounce box has the UPC code“38000 39103" while the 23-ounce box is “38000 14810.” Both have a “best if used” date of June 14th, 2018 through June 14th, 2019. And if you’re already munching on spoonfuls of Honey Smacks while you’re reading this, well, keep an eye out for the symptoms of salmonella infections. According to the FDA, most people poisoned by the bacteria develop diarrhea, fever, and abdominal cramps. The symptoms usually last four to seven days and most people manage to recover without requiring treatment.